The Premier rectangular 1 tap hole small ceramic counter top basin, perfect for installation on any counter top in a contemporary style bathroom. Precise engineering and manufacturing quality ensure long life of this visually stunning counter top wash basin. Please note, tap and waste not included but can be purchased separately. "Excellent counter top sink. Just right for a small vanity unit in cloakroom. Gives a nice modern look and very compact. Wasn't able to find anything else this small, but this is ideal where I needed it for just a hand wash facility." Good quality sink shame I was recommended the wrong basin waste to go with it. 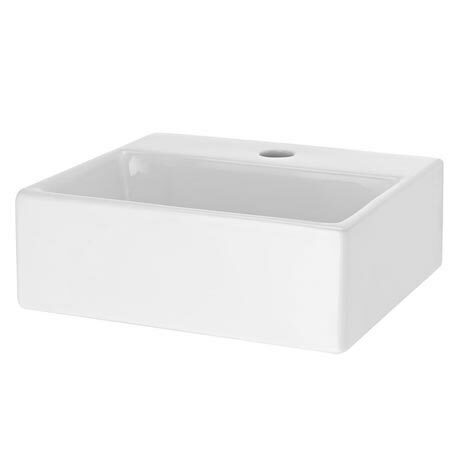 A lovely brilliant white compact sink for saving space or fitting into smaller areas. Good value for money, without compromising on quality. We are really pleased with this product and looks good with a waterfall tap which we bought to go with this product. This basin is great and exactly as described. The price was very competative and i was able to buy the compatable waste and taps from victorian plumbing.